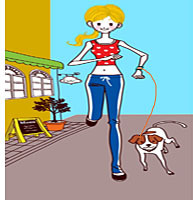 Getting Along with Your Pet < How Much Exercise Does Your Dog Actually Need? How Much Exercise Does Your Dog Actually Need? We all want our dogs to be happy and healthy! However, providing the best care possible is an ongoing learning experience. One issue many dog owners have is figuring out just how much exercise their faithful companions need. Not only can lack of exercise cause dogs to experience health problems like obesity; it can also lead to behavioral issues like whining and destructive chewing. If you’re dealing with any of these issues with your dog, or want to avoid them, this article is for you! Pet owners may wonder, “Can my dog get too much exercise?” Yes, it is possible for a dog to get too much exercise. Smaller breeds and older dogs are the most susceptible groups. While there aren’t clear-cut guidelines about how much is too much since it varies from dog to dog, the easiest thing to do is pay attention to your dog’s behavior. [Editor’s note: Our vet tells us to know your dog’s fitness level, and let them set the pace. Avoid exercising in hot or humid weather. If they start panting excessively or suddenly seem drained, it’s time for a break. Cool down in the shade, offer them water to drink, pour tepid (not cold) water on their paws or if possibly hose their body. Watch out for signs of heatstroke: death occurs within minutes of the dog’s core temperature reaching 110°F. If you see signs of heatstroke, get them to a vet immediately to increase their chances of survival.] This is especially important for breeds that have flat or short noses. In addition to those specific signs, there are a few other things to keep in mind. For breeds like Great Danes, which have narrow bodies and deep chests, it’s best to avoid strenuous exercise before or right after eating since it can lead to bloat, an often fatal condition. While younger dogs have a lot of energy, jogging generally isn’t the best option for them. Since their bones are still developing, this type of exercise can be quite hard on them. And because jogging can cause problems like hip dysplasia, the same is true for many large adult dogs. Lower impact exercise is better for these dogs. So, How Much Exercise is Needed? The basic range is between 30 minutes and two hours daily. Younger or larger dogs will generally fall on the higher end of this range. The same goes for intensity. While small and older dogs still need exercise, it’s best for them to stick with lower intensity options. Even when both activities are done for the same amount of time, there’s obviously a big difference between walking around the block and jogging up a steep path. And also obviously, start out slowly, increasing your pet’s fitness and exercise over days and weeks, just like you would a child or adult. Just like us, dogs benefit from variety. The best thing you can do for your favorite canine is to mix it up throughout the week. Keep in mind the previous guidelines we describe above. You might go to the park one day and then play with your dog in the yard the next day as you’re going through your organic lawn care routine. Also, don’t be afraid to try out different approaches. Since there’s no doubt that you know your dog quite well, you’ll be able to gauge how they react and feel about different types of exercise. It will also give you even more opportunities to have fun with your pooch! Michelle Rebecca is an aspiring writer, blogger, and animal lover. She’s the new mom to a rescued German Shepard mix who she loves more than anything! She loves that blogging gives her the opportunity to voice her thoughts and share advice with an unlimited audience.